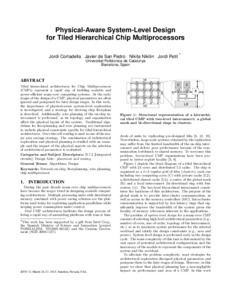 Cortadella, J.; San Pedro, J. de; Nikitin, N.; Petit, J.
Tiled hierarchical architectures for Chip Multiprocessors (CMPs) represent a rapid way of building scalable and power-e fficient many-core computing systems. At the early stages of the design of a CMP, physical parameters are often ignored and postponed for later design stages. In this work, the importance of physical-aware system-level exploration is investigated, and a strategy for deriving chip floorplans is described. Additionally, wire planning of the on-chip interconnect is performed, as its topology and organization aff ect the physical layout of the system. Traditional algorithms for floorplanning and wire planning are customized to include physical constraints speci c for tiled hierarchical architectures. Over-the-cell routing is used as one of the major area savings strategy. The combination of architectural exploration and physical planning is studied with an example and the impact of the physical aspects on the selection of architectural parameters is evaluated. Tiled hierarchical architectures for Chip Multiprocessors (CMPs) represent a rapid way of building scalable and power-efficient many-core computing systems. At the early stages of the design of a CMP, physical parameters are often ignored and postponed for later design stages. In this work, the importance of physical-aware system-level exploration is investigated, and a strategy for deriving chip floorplans is described. Additionally, wire planning of the on-chip interconnect is performed, as its topology and organization affect the physical layout of the system. Traditional algorithms for floorplanning and wire planning are customized to include physical constraints specific for tiled hierarchical architectures. Over-the-cell routing is used as one of the major area savings strategy. The combination of architectural exploration and physical planning is studied with an example and the impact of the physical aspects on the selection of architectural parameters is evaluated. Cortadella, J. [et al.]. Physical-aware system-level design for tiled hierarchical chip multiprocessors. A: International Symposium on Physical Design. "ISPD '13: Proceedings of the 2013 ACM International Symposium on Physical Design: March 24-27, 2013, Stateline, Nevada". Stateline, Nevada: ACM Press. Association for Computing Machinery, 2013, p. 3-10.